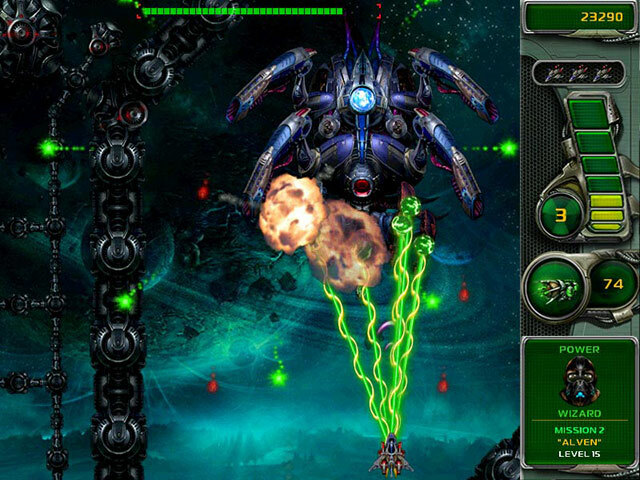 Star Defender 4 for Mac OS X is a breathtaking space shooter with splendidly craft graphics and music for Mac OS X. Face tons of new enemies with a unique style of behavior and new ways of attacking. Use new Star Defender 4 for Mac OS X weapons: machine-gun, saw, flame thrower, acid bomb and cutter! Blast through more than 100 levels, 8 original missions and of course huge impressive Bosses in the end of every mission! ...... best features of Star Defender series. You'll be dazzled by splendidly craft graphics and music. Face tons of new enemies with a unique style of behavior and new ways of attacking in Star Defender 4. Use new Star Defender 4 weapons: machine-gun, saw, flame thrower, acid bomb and cutter! And also the best weapons from the previous game: parasitron, lasers, infector, ball lightning, missiles, homing laser and barriers! Blast through more than 100 levels, 8 original missions and of course huge impressive Bosses in the end of every mission! You'll get the real pleasure playing Star Defender 4! If you need a breathtaking game that won't let you let a mouse out of your hands to have a cup of coffee, which got already cold If you want to feel as you were the Intergalactic Disinfector Number 1 who craves for taking vengeance on that disgusting annoying insects If you long for the real war - then Star Defender 4 is for you! Destroy your enemies and make youself alive. Qweas is providing links to Star Defender 4 for Mac OS X 1.11 as a courtesy, and makes no representations regarding Star Defender 4 for Mac OS X or any other applications or any information related thereto. Any questions, complaints or claims regarding this application Star Defender 4 for Mac OS X 1.11 must be directed to the appropriate software vendor. You may click the publisher link of Star Defender 4 for Mac OS X on the top of this page to get more details about the vendor.